The sun shone, we had fun, then it rained and we still had fun, except we didn’t realise until the sun shone again and we finished the event. It was awesome in just so many ways. A great technical course that kept you on your toes (okay quite literally come 1 am in the morning), some record breaking (and gazebo destroying) gales oh and some blisteringly hot sunshine to finish the event with a flourish. 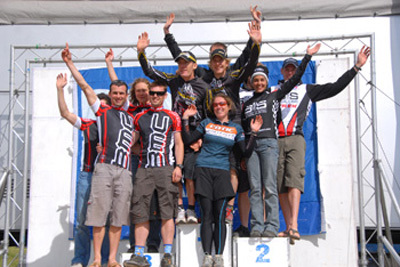 Ah that definitely was Mayhem and TORQ were there with 2 teams in the open men’s category, 1 in the sport’s men and 4 solo riders to experience it all! As the clock inched forward to 2pm and the off, riders started arriving in the start area positioning bikes ready to find them again after the traditional ‘Le Mans’ start; this is a quick run around a small loop to separate the riders out and what a spectacle it is, hundreds of brightly coloured lycra clad people, sprinting, cavorting, hobbling, walking and in one case cantering… there was definitely a pantomime horse in that lot….. 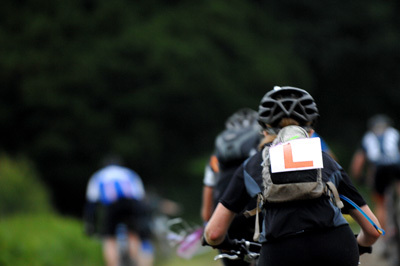 Ahead lay a newly crafted 8.5 mile course, weaving its way up and down the valley, threading enticingly through the campsite then heading off up through wicked singletrack across soul sapping climbs over looked by the majestic Eastnor castle. The trail held such delights as ‘Vietnam’, a wicked off camber root lined section closely followed by ‘Death corner’, an intriguing little hairpin before making it’s way through trees just handle width wide then dropping in Dymond’s Ditch (fame at last, a ditch with my name on it!) 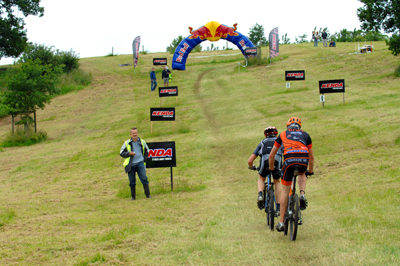 down the old Kenda climb into the campsite, heading off just before hitting the finish straight to begin a climb that gave you a great view of the arena if you stopped for the obligatory Red Bull, before heading off for a quick 3 mile squiggle until eventually emerging unscathed, mainly, to hand over to the next man, or woman, waiting eagerly in the change over section. As the day progressed, the weather seemed to ease and although there was no blue sky at least the fine drizzle cleared up leaving the riders free to tear up the course hour after hour, with each race category’s lead seemingly constantly changing hands. Those that weren’t riding seemed glued to the screen that hosted the results to constantly check positions. All was calm, all was going smoothly and then all hell broke loose as at about 11.30pm the heavens opened and dumped a good dose of water on the course for at least 90 mins. The result? Hundreds of hardy and determined riders slipping and sliding as they slowly made their way through the carnage as the course quickly changed from smooth fast lines to battle lines in the Somme. For many it was a lap too far and they quickly headed for their tents and called it a day leaving the rest to take on the challenge. 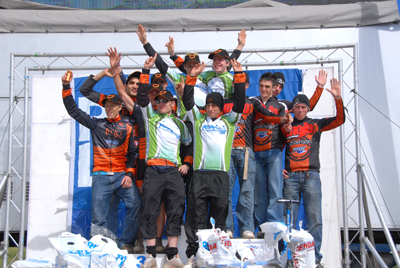 But team TORQ riders gave it their all. Rob before the heavy rain set in. How many medals can he award himself with?? The most coveted and definitely the hardest races of the weekend had to be the soloists. 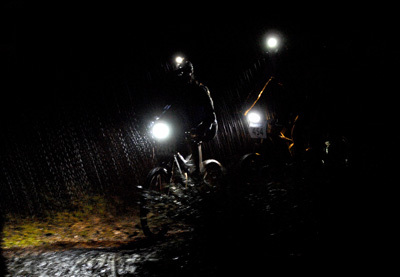 Year on year we see this section grow as riders looking for the ultimate challenge push themselves and their comfort zones in pursuit of that elusive win. Only the best survive, this toughest of the tough. 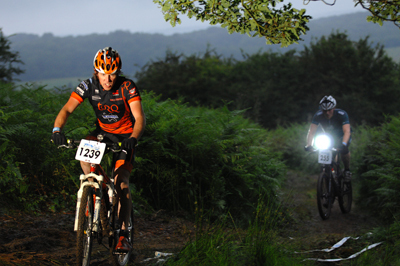 24 hrs with just you and the bike, persuading yourself to push those pedals round one more lap time and time again. Battling not only other competitors but also your own demons. All that time alone, coupled with sleep deprivation and extreme physical action can play funny tricks on your mind. So this not only takes physical fitness but a mental strength that only experience and grim determination and stubbornness can provide. Lydia Gould and Emma Bradley represented TORQ in the ladies solo. 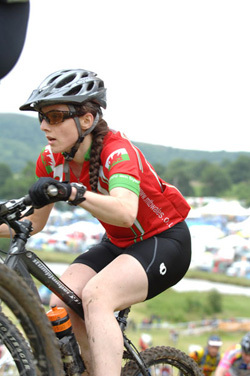 Lydia hasn’t done a 24hr enduro event for a long time but her sheer grit and determination saw this veteran rider forge her way to a fine 4th spot, just 2 laps behind the winner, youngster Sally Bigham, while Emma had a much better ride this year in her first’ proper’ solo coming in for a magnificent 5th spot. Read both riders experiences further down this page. Lydia and Emma on the podium. Meanwhile the solo men’s race was to be a war of attrition, with defending champion Anthony White determined to keep his winning ways. 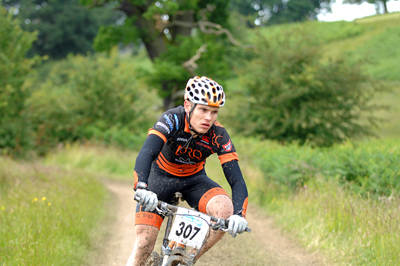 In his way to his second victory was TORQ rider James Lister. Lister was the man making the pace, setting off at blistering speed, but 11 laps later and Lister’s race was over with chest pains making him pull out. White finally took his second win with 20 solid laps. 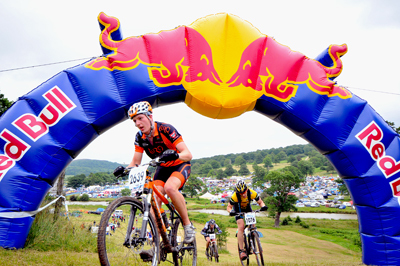 Young TORQ rider Charles Newton-Manson also competed in the competitive men’s solo, racking up 16 laps to place 10th overall and magnificent achievement in such difficult conditions. 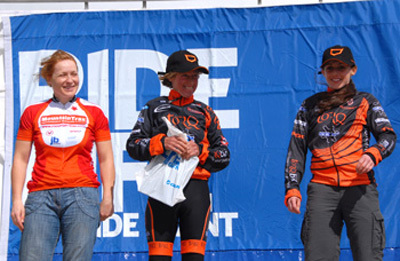 Finally a mention has to be made of TORQ supported riders Mel Spath and Kate Potter, who competed in the ProMixed race. With a £5,000 prize purse up for grabs this category was explosive. In the end Scott UK, with Kate as their lady took the pot with Mel’s team, BMC/Extra UK settling for 3rd. 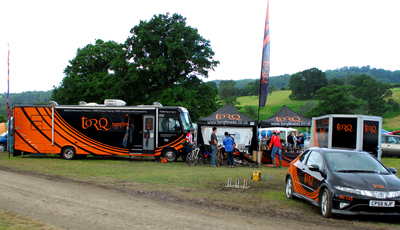 The team did well they were 2 laps ahead in the end and the 3rd placed Torq team it was very close. We thought we were first and second but there was a mix up with Mojo, so in the end we were 3rd but that was fine. The team was really driven to complete it, they all rode really well in the mud and I think that was the thing, sometimes it was tyre choice but more often than not it was just down to keeping the wheels moving. If you slowed down you were stranded, you couldn’t do anything, but while the wheels are moving they’re shedding mud. 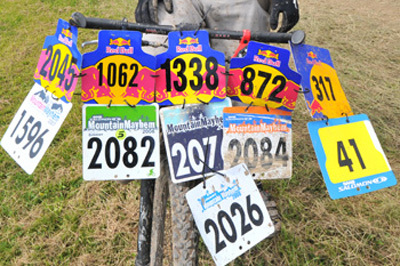 If you slow down to a certain speed they just accumulate mud and you stop. It was a great weekend, good to see so much black and orange on the podium, but only dampened by the fact that Pat was taken ill.
When’s the rain coming? I asked Malcolm as we drove to the event. I didn’t really need to ask. It came, as predicted, washing away hours of course builder’s work and leaving an off camber super slime. Great fun as you and your bike slid down into a forest of Bracken! I was prepared for everything, and the car was packed so full we could hardly get ourselves in. Soon I was out there and powering up the first climb, heart rate at 165 (I’m supposed to ride at 130) only to get stuck in a long queue waiting to get down some singletrack. Keep cool, I said as I felt the adrenalin rising. 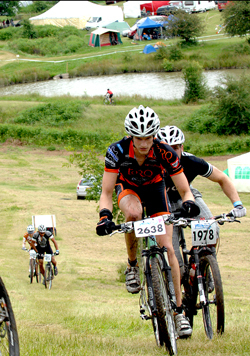 The first laps flowed by, and I was enjoying the course with its technical downhill and some good climbs. By the time darkness came I knew every twist and turn. A craving for a bacon sandwich got me sprinting down the descent at the end of the lap almost taking someone’s tent down as I rode through the guide ropes. Malcolm was waiting, bacon sandwich and mug of coffee thrust into my hand. While I ate, he was busy cleaning my bike and getting some clean kit ready. Out again, before I got too comfortable. Dawn broke at last, after a 2hr 20min lap, numerous crashes and a flat tire. 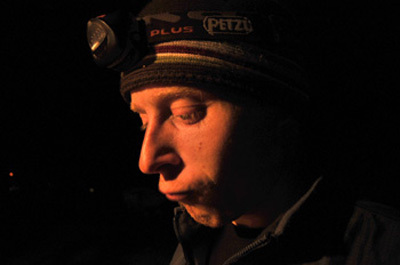 It brought with it a howling gale that sent some tents flying like kites. Suddenly I seemed to be riding fast again (fast in solo-land that is!). 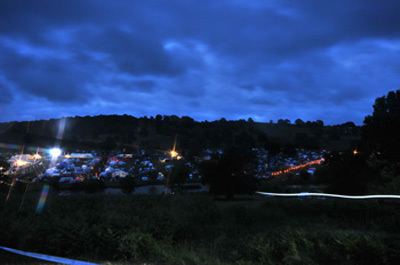 The sun shone, the course dried up, and the bacon and sausages were sizzling in the campsite. Oh it was so hard to ride past them! A few more laps and it would be 2pm finish. To loiter or not to loiter, that is the question. However, we weren’t supposed to, so a steady lap would bring me in at 2.15. Into the finish area and people cheering. It felt wonderful and I knew I’d be running on adrenalin for some time. Of course I couldn’t have finished the event without the support from Malcolm, TORQ, and Joe my physio plus everyone who cheered me on, so huge thanks to you, and of course Pat Adams and his team for bringing us Mayhem! 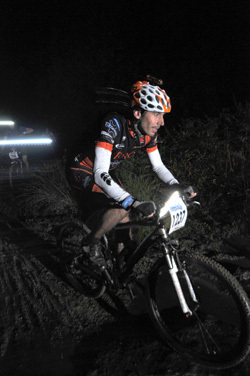 Mountain Mayhem, my first ‘PROPER’ 24hr solo. Why my ‘first proper’ 24hr solo? 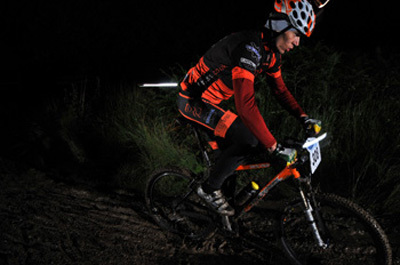 Well last year I attempted Mayhem solo, but a badly adjusted saddle and which caused constant chronic backache and 9 hrs off the bike meant Mayhem ’08 where I went the distance so to speak, was my first true solo. I knew I’d have to be super organised. So Wednesday and I’ve still not done anything, except my recovery sessions, as I’m a good girl Matt, but at least I did manage to start that evening…plugged my lights in! I did manage to also divide out energy into Ziploc bags so refilling would require zero thought when I was foggy brained. By Friday morning I’d even managed to fit my mud tyres to the hardtail, as lets face it, it’s Mayhem and there’s going to be mud. 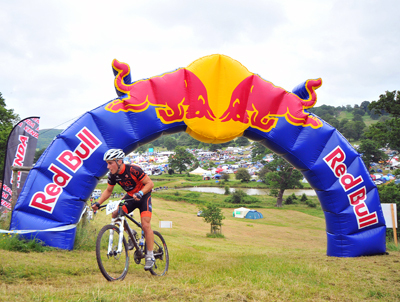 Armed with my trusty hardtail (wet bike) and my lovely bouncy race bike (dry bike) I headed down to Eastnor. Organised as ever, first order of the day once the tent was up was to head over to the guys at Shimano as I’d had a new front mech fitted to the hardtail which turned into a right palaver but they managed to sort it for me, then I Popped into registration and signed my life away… Since it was nice and dry, (surely it can’t actually stay dry the BBC showed a mass of blue watery stuff over Eastnor? ), I opted for the dry bike and headed out for a lap. Best mayhem course I’ve ever ridden, I really enjoyed it even though at points I was riding along thinking “ooh that’ll be hell when it rains with the off camber bit” and “the fun riders aren’t going to be riding those steps and that hairpin”. Saturday morning came and a cup of tea, three oatabix’s and some crunchy nuts later (I’m not sure about the GI on this brekkie but I can keep it down so that’s a start) Before I knew it, 1pm was here and the rider briefing was suddenly looming and then 2pm was creeping ever nearer and I made sure I had everything I thought I needed on my table, whilst everything else was strewn about the inside of my tent, plus I thought it was possibly time that I made sure I was correctly attired for the task I was about to set out on! Tick, tock, tick, tock glancing at my watch each minute but also staying calm, some deep breaths and my plan of action running through my head…jog, get bike, ride smoothly and include some smiles and laughter along the way. 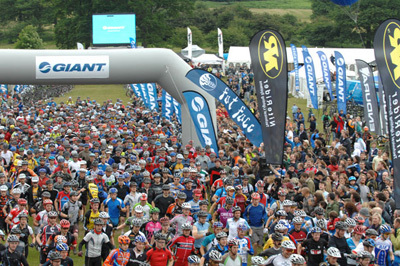 Mayhem was about to start and I was in a good mood and looking forward to 24hrs of solo riding (some people clearly think this is wrong however!). Just a few more Mayhems to ride to get that many boards. Suddenly we’re off. I must say I really, really detest running in bike shoes, but round the lake we went, over the bridge, other side of the lake, onto the tarmac, hop back onto the grass and eventually back into the arena. Chaos as people and bikes go in all sorts of directions. Thankfully that plan of having my bike so close to the start/finish line played off in that I grabbed it and threw myself onto it and whizzed off, perhaps a little too fast, but I wanted to clear as many people as I could before the first singletrack. As I came through to complete my first lap, Mark, Mel Alexander’s boyfriend & pit support, told me I was 4th and about 4mins behind 3rd, which was Fi Spotswood. Whilst the course was wet, it wasn’t raining and 2 more laps in I was enjoying riding my hardtail plus I’d gained on 3rd place. I stopped briefly to grab a fresh bottle since I’d not been drinking enough and was determined to start drinking more otherwise I knew I’d be ending this journey sooner rather than later. I decided to go out for another 2 laps and then come in and kit up for the night. The course was much nicer now once everyone had spread out. As I approached the end of my 5th lap I finally overtook Fi to take me into 3rd, however it was extremely short lived as I came in to ready myself for the night. After a considerable amount of faffing, I eventually set out on the start of my night laps. I have a feeling it was at the end of this lap that Lydia Gould caught me up, coming past and then suddenly she was off the side of the trail. I asked if she was ok, and eventually she came back past me saying something about stopping for a bacon butty at the end of the lap. Not too much later Lydia overtook again and stayed in front this time. This is where it all goes a bit fuzzy. I may have ridden a few laps in succession, and the rain did start to come down quite heavily at times and I know I eventually came into the pits as I knew the bike would need cleaning off as the mud had been getting seriously sticky. I felt it was time to crack open the forest fruits for that extra bit of zing! Bike back lovely and clean and I headed out again, with an extra layer on, onto what had to be the worst lap of the entire event. 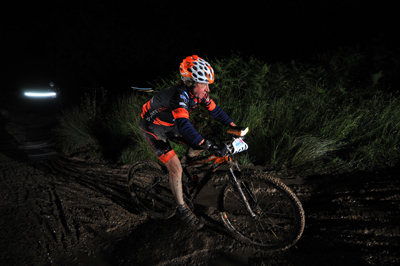 The conditions were getting worse, the mud stickier making much of the course a slippery must do walk rather than a ride. After however long it was I almost rejoiced as I reached the watery mud section that led to the field. At least here I could get on and ride, in a fashion, and just try and navigate my way through the mud stream that had developed without hitting any of the trees. By day this section looked as though a bomb had gone off in it and was wrecked. Managing to get down a few of the steeper sections alive, and riding the odd bit, I got to the very interesting off camber section in the trees where the aim was to go from the lower level to upper whilst going over some roots here and there and then out into a fern section. Trouble was, no grip for the bike or shoes and so some form of new technique was tried whereby I managed to get the bike at a higher level than myself and then lift it up to a higher ridge that was developing, I than had to try and get my feet on the ridge my bike had been on previously, usually using a nearby tree for help. Even once out the trees trying to ride the next section proved impossible too. Finally, I managed to get back on the bike and ride, briefly. The new design mud tyres would never catch on..
Another tough lap, but much easier than the last and also perked up when Anth came past with a ‘that’s my girl’ after seeing I’d gone out again. I believe by this point the sun had started to shine and things were drying up, as in true Mayhem fashion you only get a glimpse of what could have been a super fast course on your last lap. There was still some way to go before my last lap however, and near disaster was not far away. I was on one of the climbs and decided to go through a puddle in order to help wash some of the gloopier stuff off the bike. As I exited said puddle there was an almighty jolt and I slammed the brakes on. Looking back and down with fear one of my worst nightmares had come true. The Rear mech was now in back wheel A bit of manual handling and I freed the mech from the wheel, after a bit of time I had a rear mech in my back pocket and my first ever singlespeed. The fit wasn’t quite perfect however with the chain and I knew it’d be jumping but at least it was rideable, to a degree. Back at the pits I swapped bikes for my trusty Specialized Era. Certain points around the course proved interesting with a very grippy front, which loved to hold onto the mud, and a less grippy back so that was all over the place. As it was, the course dried out even more and as ever the last lap was one of the best! Just approaching the last grassy descent for the final time, Mel Alexander appeared so the three of us finished together with Mel taking an excellent 2nd, me 5th and Lorraine 6th. The rest of the top 6 finished soon after then with Lydia in 4th, Fi in 3rd and a huge effort from Sally giving her 1st. I couldn’t quite believe that I’d finished and was feeling wide-awake after 24hrs of riding, I almost felt like I could have carried on for a bit longer! Anth pouting cos he knows he’ll never ride as many laps as Emma.. Although Rob wasn’t there for the event, I couldn’t have done it without your help since you spend what seems like hours taking care of the bikes as well as me and finally Matt Hart, the man who has done a fantastic job of getting me in the sort of shape that allows me to survive such a race. Huge, huge thank you’s to everyone and finally to the crew of Mountain Mayhem who without which we wouldn’t have the event. 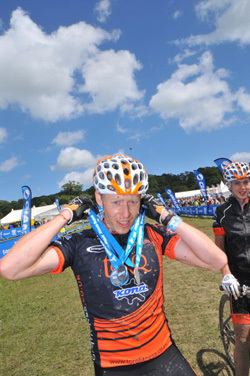 Part of the Mayhem madness and not a side effect of TORQ products!